The Library's subscription to TumbleBooks offer access to eBooks for kids in three levels - TumbleBookLibrary and TumbleBookCloud and TumbleBookCloud Jr.
readers a selection of online books, searchable by age groups, which have been created from existing books. TumbleBookCloud Jr. has over 300 titles and reading levels from grades 3-6. It is a great option for adventurous young readers who wish to go beyond the picture book collection in TumbleBookLibrary! TumbleBookCloud Junior contains early reader chapter books, children's classics, graphic novels, children's audio books and new National Geographic videos - many of which are paired with our e-books - a perfect complement to support Common Core Curriculum! 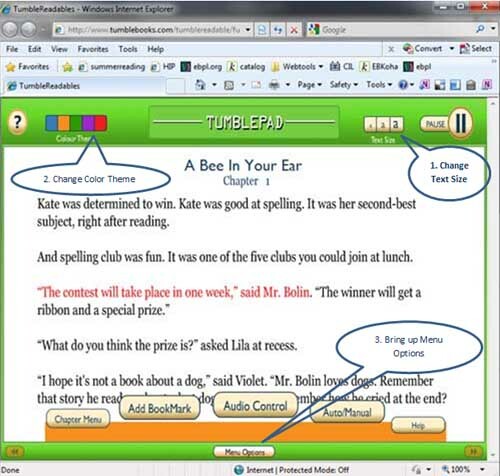 TumbleBook Cloud books are Read-Alongs and feature adjustable online text and complete audio narration. Sentences are highlighted as they are being read and the pages turn automatically. They can be viewed in 3 different text sizes. Read-Alongs are great for emergent, struggling, and reluctant readers, and are an excellent tool for ESL students. With a fun, stylish new interface, Read-Alongs will also appeal to accomplished readers who are excited to follow along to the narration of their favorite books. The collection features 8 categories containing 125 Read-Along titles and an additional 100 large print online titles. The collection includes popular sports themed books by Matt Christopher, titles from the popular Judy Moody , Nancy Drew and the Clue Crew, and Sleepover Squad series, high interest/low level books for Middle School and High School from Orca books, and classic children's literature such as Black Beauty and Call of the Wild. These Read-Alongs highlight the sentences as they are being read, turn the page automatically, and offer the ability to follow along in 3 text sizes. They also include an innovative bookmarking feature, the ability to switch to manual in order to read at your own speed, and cool color options for the skin of our new Read-Along player. Add a BookMark to mark your place. Adjust the volume with the Audio Control button. Turn the pages manually with the AutoManual button.